BANGKOK (AP) — Anti-government protesters are rejecting negotiations in a monthlong standoff that has escalated into clashes that killed 20 people. Protesters are digging into encampments around Bangkok today in Thailand's worst political violence in nearly two decades. The demonstrators are demanding that the prime minister dissolve Parliament, call early elections and leave the country. Bullet casings, rocks, pools of blood and shattered army vehicles littered the streets as protesters showed off captured military weapons. They also broke into a satellite communications complex, forcing the operators to restore the Red Shirts' vital People Channel television station, which the government had twice earlier shut down. Foreign governments issued warnings for citizens visiting Thailand, where tourism is a lifeblood industry. THIS IS AN UPDATE. AP's original story is below. BANGKOK (AP) — Officials say at least 18 people have died and hundreds have been injured in the latest violent clashes between anti-government protesters and Thai soldiers. Although both sides have retreated, they're no closer to ending a month long occupation of parts of the capital by demonstrators demanding new elections. A Thai government emergency center says five soldiers and 13 civilians, including a Japanese cameraman for the Thomson Reuters news agency, were killed. 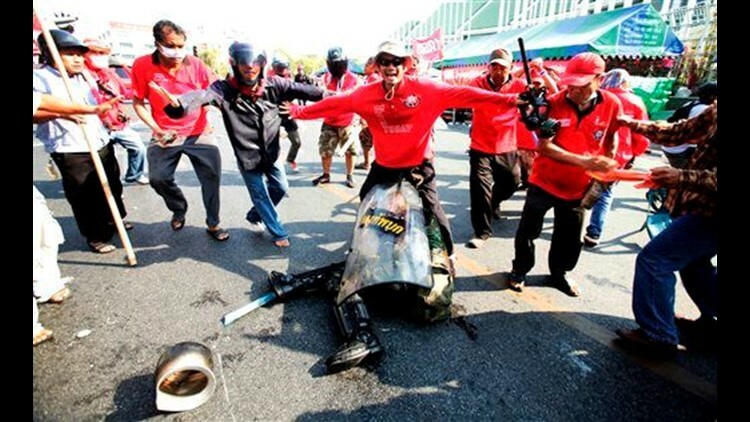 Editorials in Bangkok newspapers Sunday are calling for urgent talks between the government and so-called "Red Shirts" to end the violence, noting that some protest leaders are ready for negotiations.